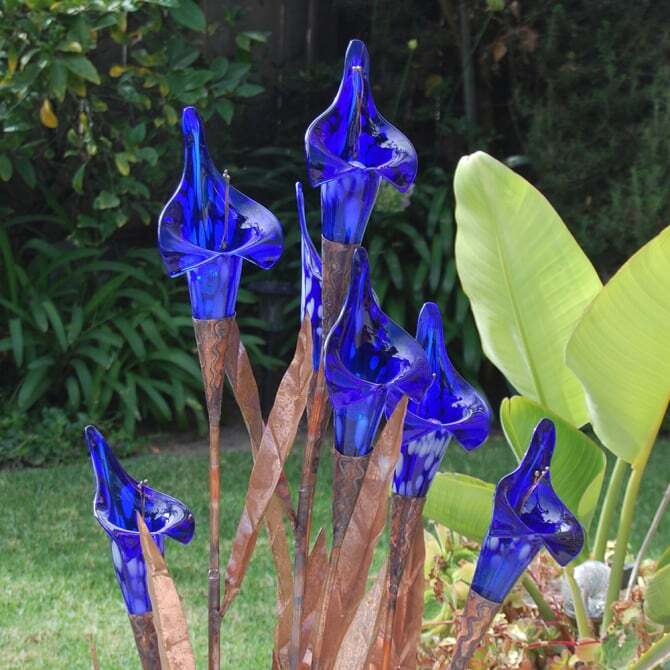 The Malibu Oracle Fountain is a stunning focal point for the garden, or indoors in a large lobby of a home or commercial entity. Hundreds of small hand cut leaves are layered upon each other at the end of every branch. The trunk of the water fountain is formed by hand in bronze and even without the water flowing the tree is a magnificent piece of art and sculpture. 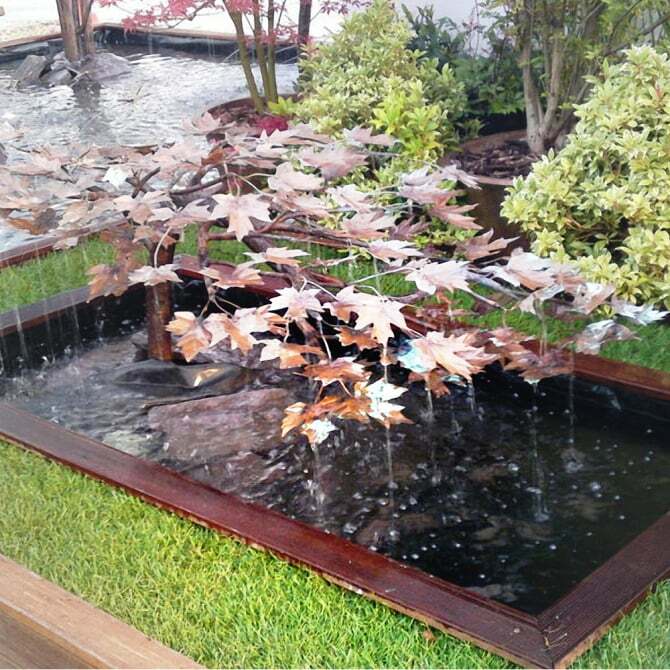 With a bonsai tree look, this water feature will complete a setting that has been designed with an Asian theme. There are many other applications for this fountain and garden sculpture, it would work in a desert home, mountain retreat or coastal garden. The cascade of this water feature is more lush than some of the other tree fountains because the amount of leaves the carefully piped water is flowing over. 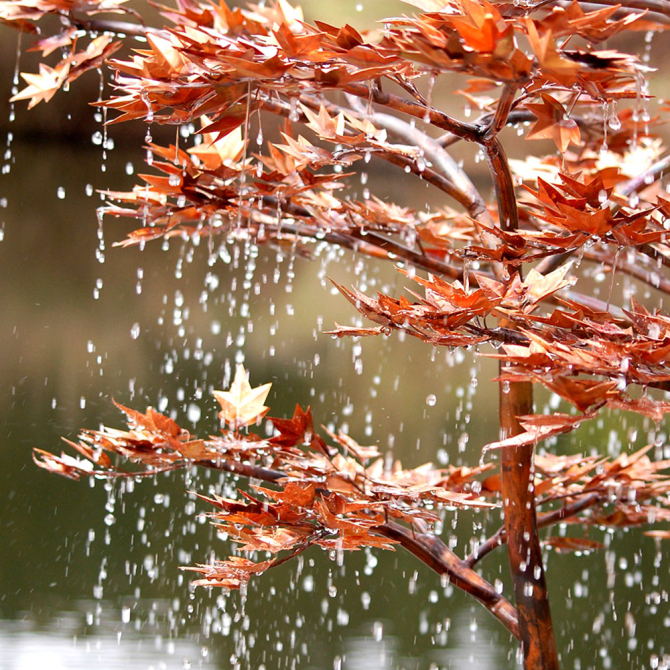 The leaves are arranged to pool the water before they fall onto the next branch of the fountain. Height: 5 ft 5 in. 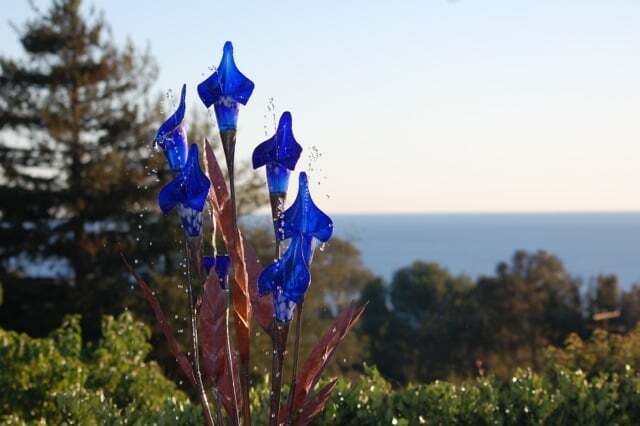 Uploaded by Lisa @MalibuFountains on 2018-08-20. Diana is a water feature with grace and beauty, from its elegantly shaped branches to its hand- cut, oak shaped leaves in shimmering copper. The Diana Fountain takes pride of place in any setting, with height and width. Each branch has a stream of water that spills out from the tips, allowing for the drops coming down to create a symphony of soft rain. A beautiful garden sculpture in its own right, when the fountain is turned on, it brings this sculpture alive with sound and movement. The willow tree figures in mythology and literature as a symbol of the moon, water, grief, healing and everlasting life. These themes refer to the willow's propensity to grow near a source of water, which can be an underground spring or stream. Its reputation as a healer was enhanced by the fact that salicylic acid, an ingredient in aspirin, comes from the bark of the willow tree. The Water Willow Fountain is a truly eye-catching focal point whether it is placed in the garden, on the patio and even on a balcony! As water cascades gently over the slender hand-cut and crafted leaves of this classic Weeping Willow, the water fountain comes alive with the pleasing sound of water trickling into the pool below. The water feature is a beautiful piece of garden art or garden sculpture that will age over time and acquire a lovely patina of turquoise green. Over the centuries in Japan, there has been a massive amount of poetry written about maple leaves and maple trees in the fall. Maple leaves and trees figure prominently in classical Japanese waka (和歌) poetry. They can be frequently found in the hyakunin isshu (百人一首) genre of waka, where images of falling red maple leaves compliment the emotions evoked by the poetry in the classical Ogura Hyakunin Isshu anthology. 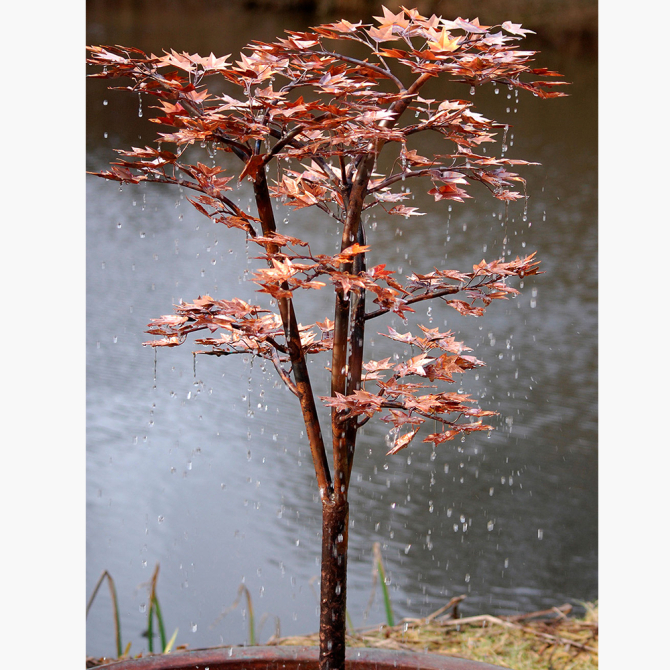 The Japanese Maple water fountain with its bronze life-like hand formed trunk and branches of copper maple leaves carefully and individually cut by hand is our most popular water fountain. This elegant, graceful water feature can be placed out on a deck, patio, in a courtyard, even inside a large entry hall. 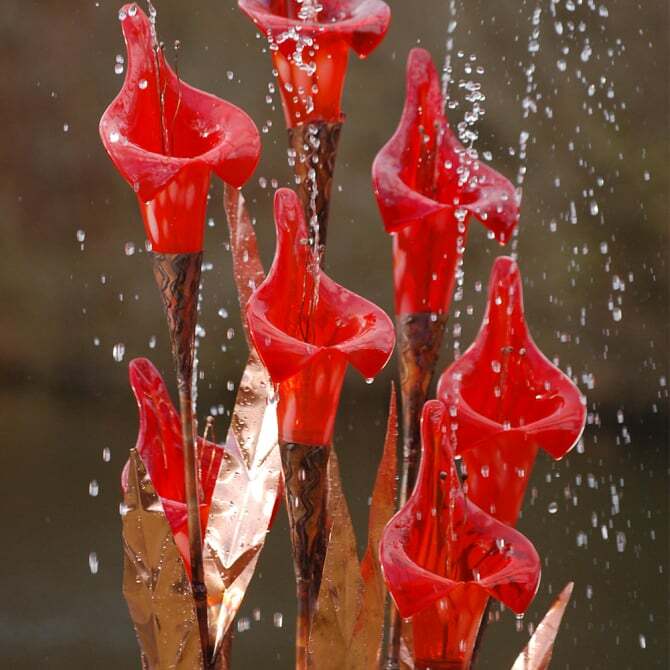 Especially effective in an Asian themed garden or home, the fountain will add the perfect focal point to draw the eye and soothe the senses. 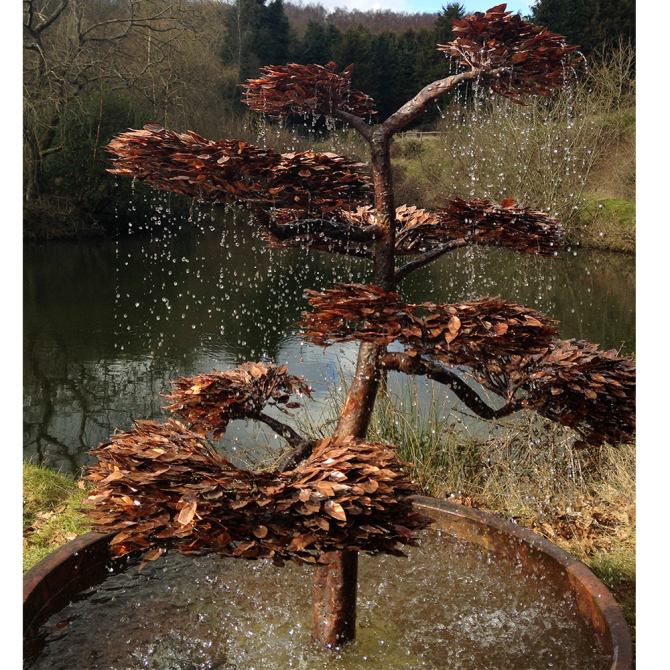 The water has been painstakingly piped through the branches to create the most realistic cascade over the leaves. A water feature is a very important part of creating a garden that flows with good Chi energy and every Feng Shui experts recommends the placement of a fountain in the home or garden.. 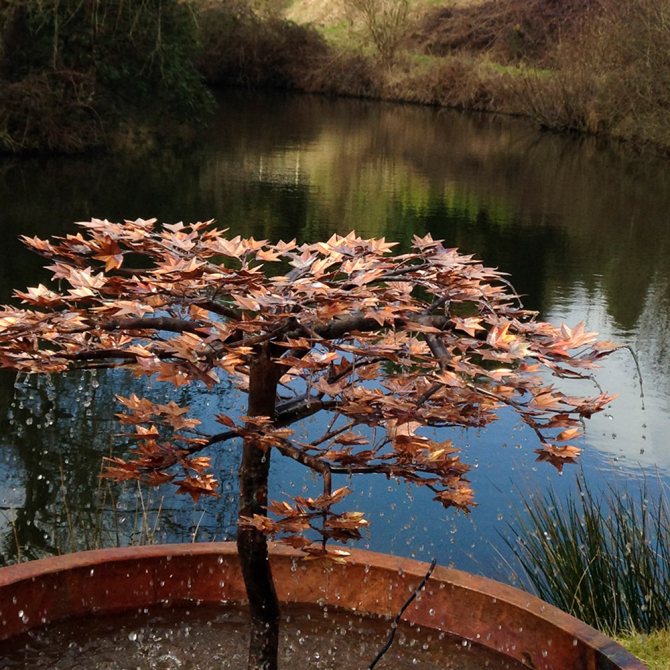 The copper leaves will gently age to a green patina over time, and as the tree fountain has be crafted by hand it will stand as a unique piece of garden sculpture and art inspired by nature for years to come. Each water fountain from Malibu Fountains has been inspired by something seen along walks through woods or gardens, The bowed bronze trunk of the water fountain, sweeps down in a graceful bow as if it were leaning into burbling stream. The flat lying maple leaves glint in the sunlight as the water gently cascades into the pool below. 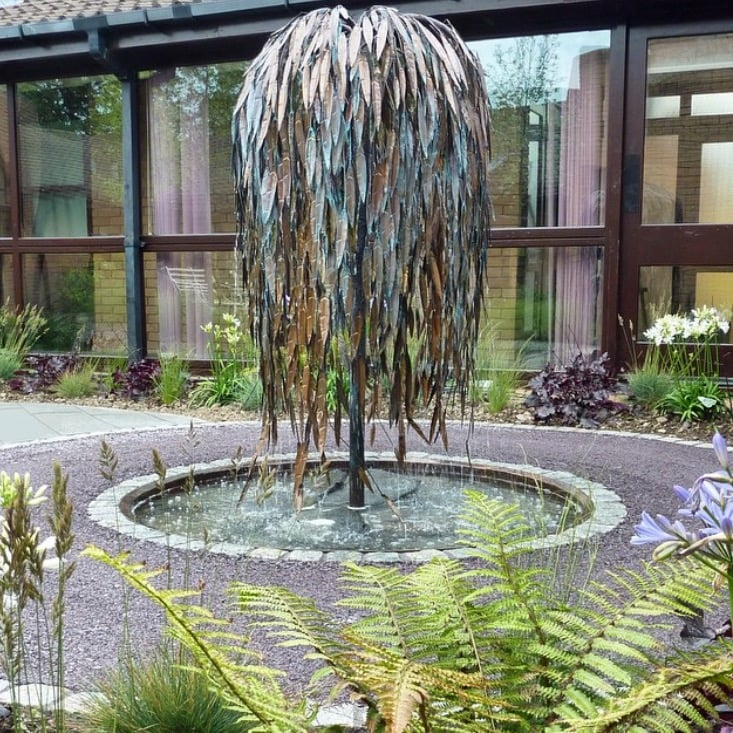 This water feature/sculpture looks equally mesmerizing as a focal point in dry-scape setting where it can be nestled into a pebble or cobble stone bed and the water flows into an underground reservoir. See our gallery for video of the Sweeping Maple. The Sweeping Maple requires a minimum pond size 40 in (width) x 65 in(length) with a minimum depth of 6 in to contain it. Symbolic Celtic Oak Tree Meanings. The oak is considered a cosmic storehouse of wisdom embodied within its towering strength. Ancient Celts observed the oak's massive growth and impressive expanse. They took this as a clear sign that the oak was to be honored for its endurance, and noble presence.
. This water fountain is an exclusive design as are all of Malibu Fountains and no two fountains/sculptures are alike. 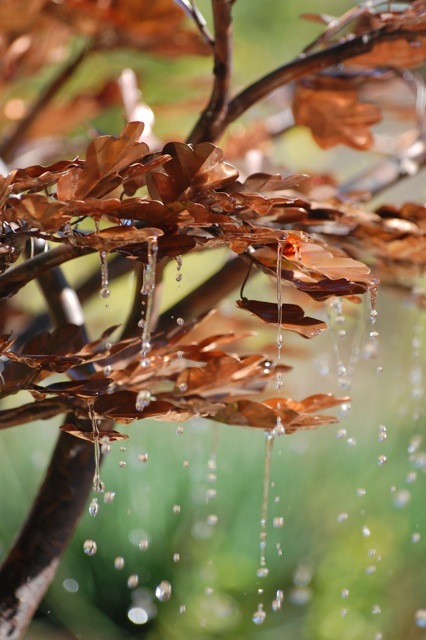 The copper leaves are hand cut individually to look exactly like an oak leaf, and the tiny copper piping has been painstakingly laced up the branches so that the water spills over the leaves in a sound reminiscent of gentle rain in an oak woodland. It is one of our most popular water fountains. 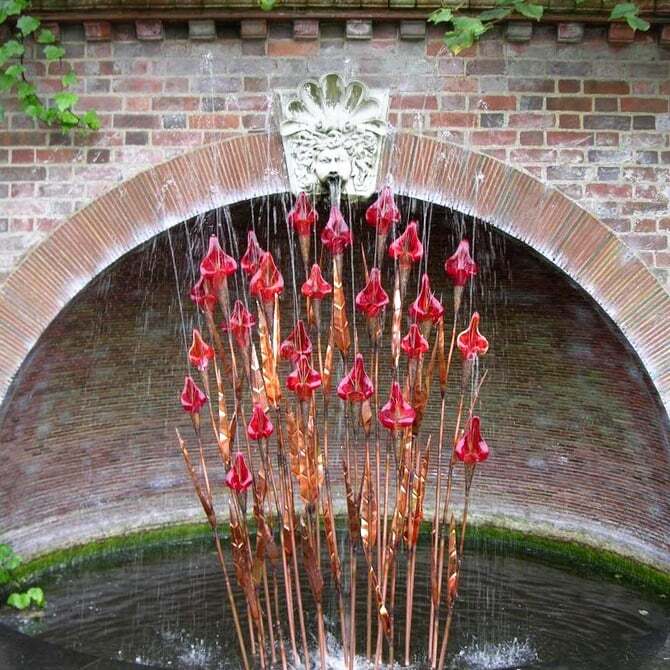 One of the most effective ways of displaying this water feature, is to have the fountain cascade into a landscape of river stones and into an underground reservoir. It is a straight out of the box, plug-in water fountain for an instant transformation of any setting. Width: 3 ft. 3 in. 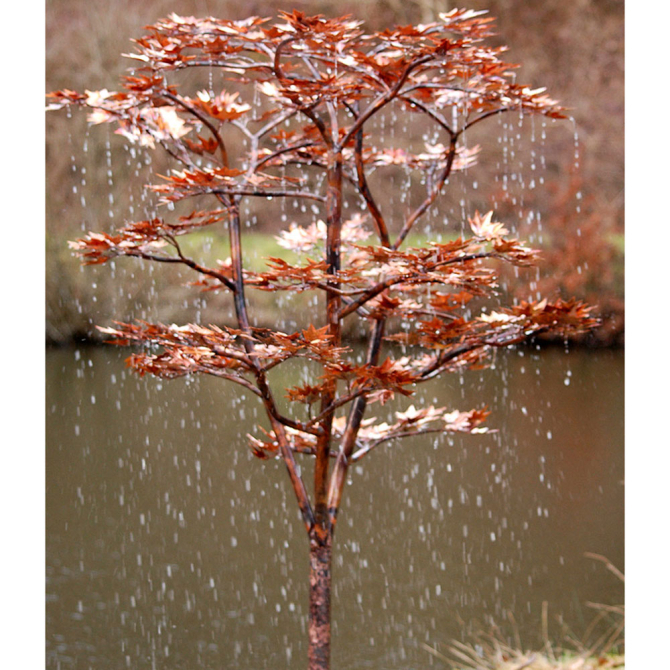 The Escondido Copper Tree Fountain is a mid-sized water fountain with oak shaped leaves and graceful spreading branches. 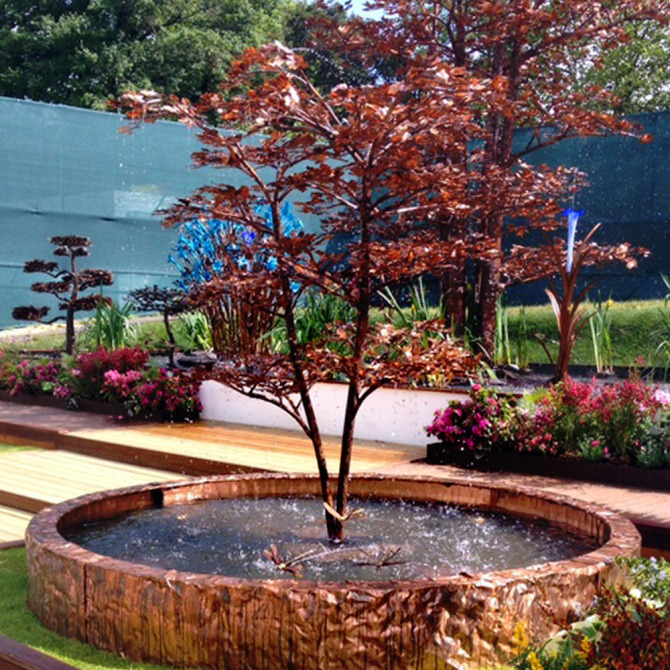 Every tree fountain is a unique piece of sculpture that is set apart by the fact that it is also an exquisite water feature that is unlike any other in the water fountain or water feature in the marketplace. 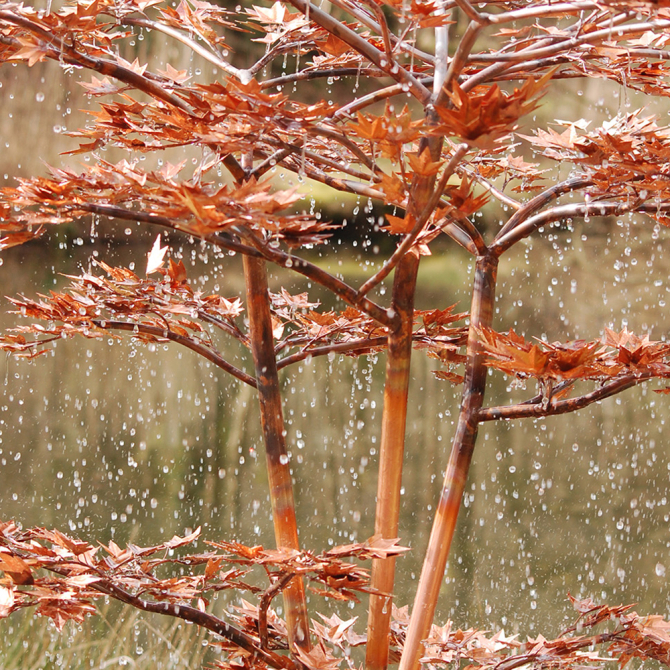 The copper tree fountains are painstakingly crafted, with every leaf, on every fountain, cut by hand and the piping of the water through the branches engineered precisely to mimic the musical sound of gentle rain cascading off the leaves. The water fountains look beautiful not only situated in a pool or pond, but also in a landscape mindful of water use, where it can be placed atop river stones hiding an underground reservoir. Whether one has their own winery or just loves the look of grapevines, this unusual water fountain has been created for lovers of the vine. 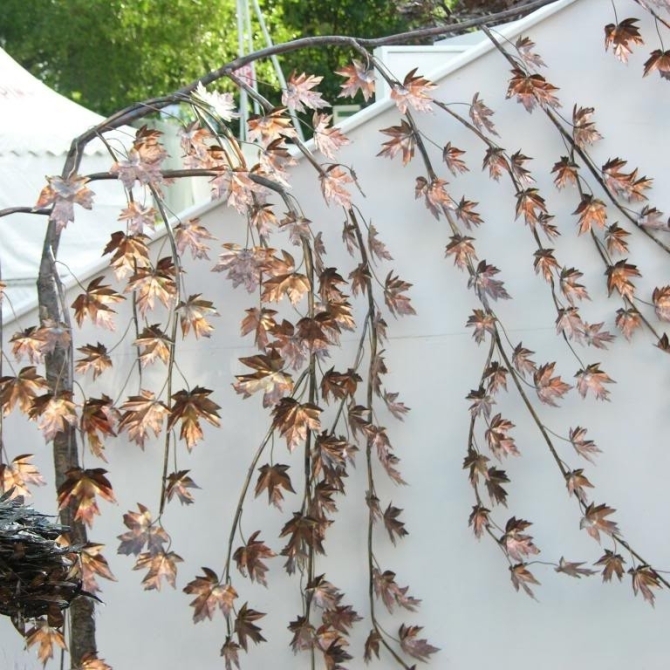 Hand cut copper grape leaves attached to a slender copper vine, adding the musical, cooling sound of trickling water to any wall, fence or arbor it adorns. 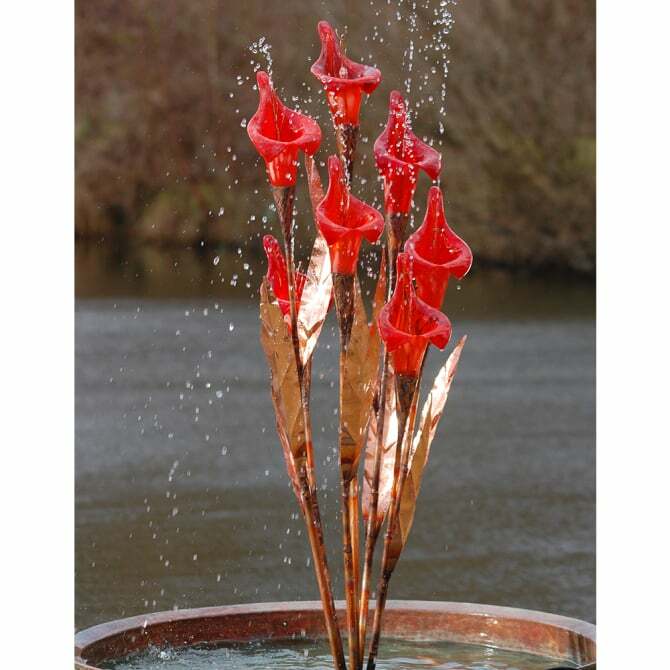 This water feature is easy to place on a patio or on the wall of a terrace or balcony, where it will instantly transform the setting to something special. 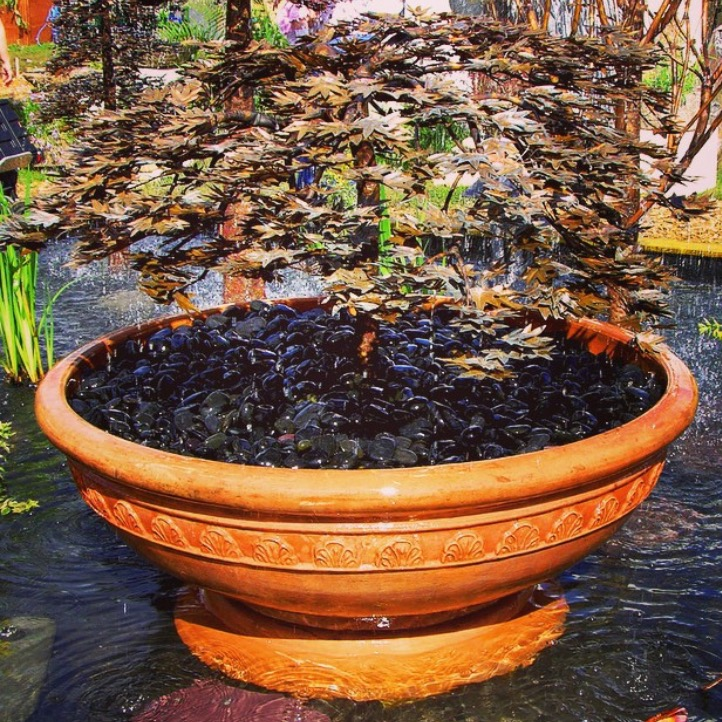 Water features are integral in all designs that incorporate the importance of Feng Shui and how it affects the happiness and prosperity of the home or business. The copper grapevine wall fountain will age and patina over time growing more beautiful as it acquires hues of green and turquoise blue. 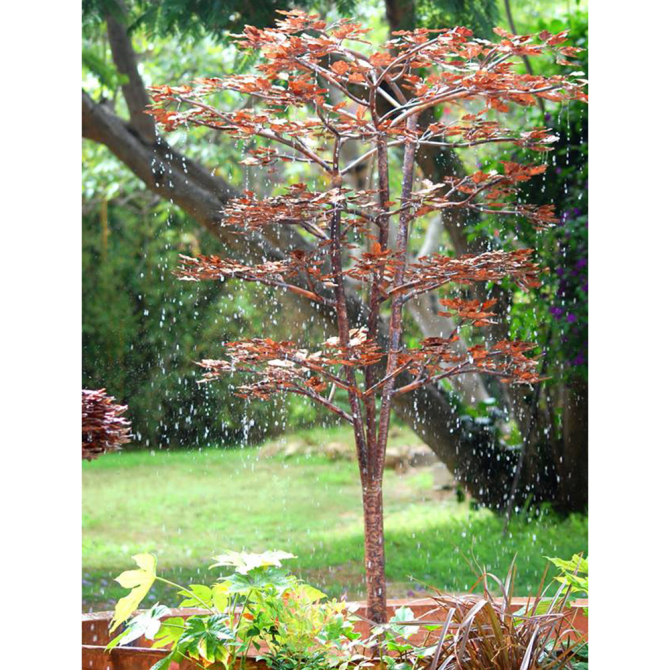 The Topanga is a tree fountain that fits beautifully into smaller spaces, indoors or out . Water features come in all different shapes and sizes, mainly manufactured in formed concrete, Malibu Fountains are handcrafted in copper and bronze. 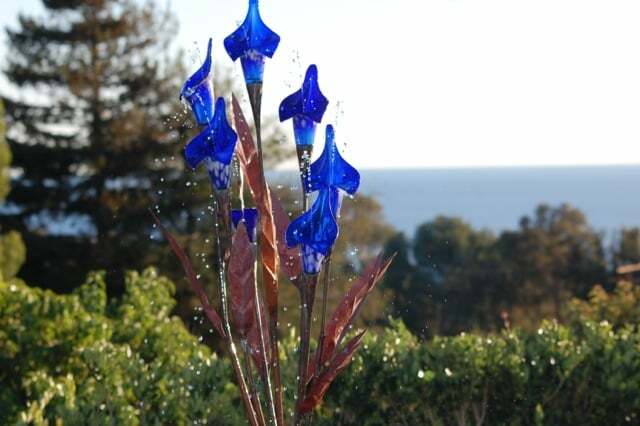 To own one is to have a piece of art in the garden as well as the most unique water feature available on the market today. All of the fountains are crafted to last a lifetime and will age and patina over time to beautiful hues of blue and green. Width: 3 ft. 11 in. Our favorite sculpture/water feature is the Luna. The shape is so striking, and the cascade from its many leaved tiers excites the senses in such a pleasing way. 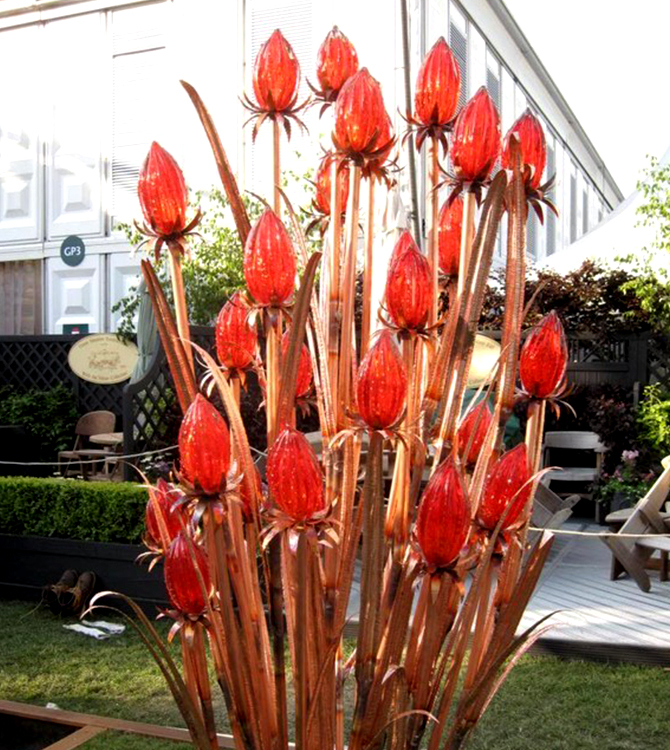 As a centerpiece in a large garden or corporate entity, this fountain truly commands the space. The time and painstaking attention to detail that is the Luna Fountain is quite astounding. 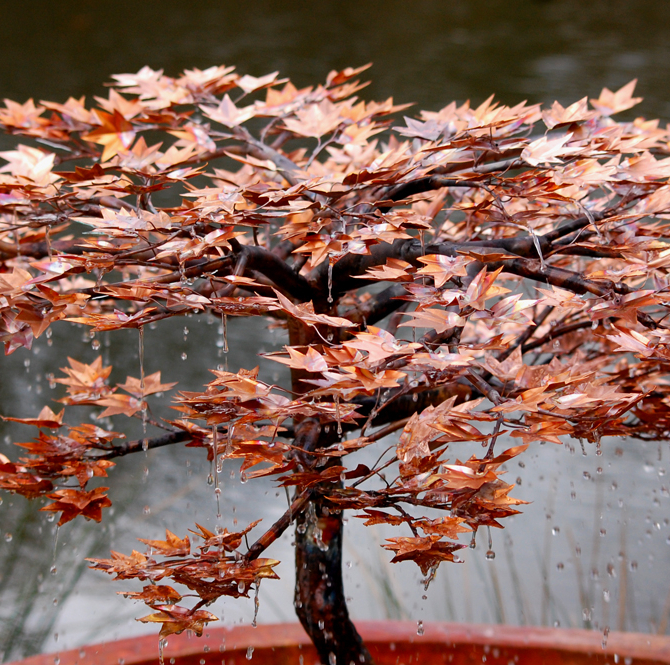 Every leaf is cut and formed by hand, hundreds of small leaves layered over each other in a bonsai tree effect. The trunk of tree fountain is hand formed in bronze and will patina into the most lovely shades of turquoise and green. Incorporating the teachings of Feng Shui for home or business is a common practice and a water feature is considered a must. Any of our Malibu Fountains would provide a much desired aspect to a well designed, happy chi energized space. One of the larger water features to situate in an open space, or within a commercial entity such as a spacious indoor atrium. 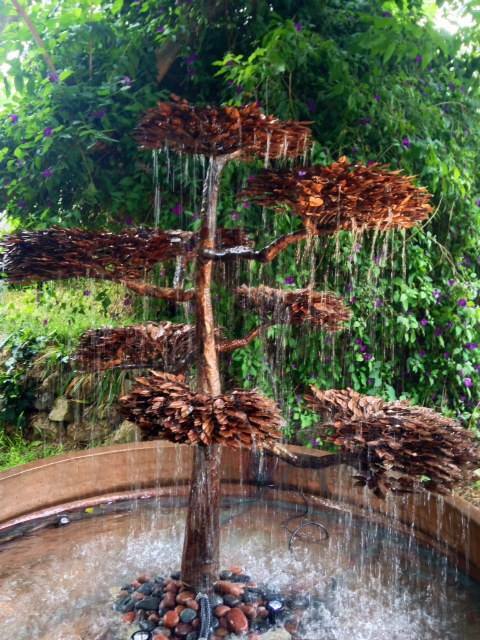 The Tree of Wisdom water sculpture is truly a centerpiece that will stop you in tracks as you gaze upon it's beauty and listen to the rush of many drops of cascading water hitting the pool below. This unique piece of garden art adds so much to the environment bringing good chi or positive energy to the home or garden. A water fountain is very important in Feng Shui and is an essential part of Feng Shui design. The trunk of the sculpture is in and of itself, a thing of beauty and craftsmanship, handmade in bronze, it looks like the trunk of a very mature tree. 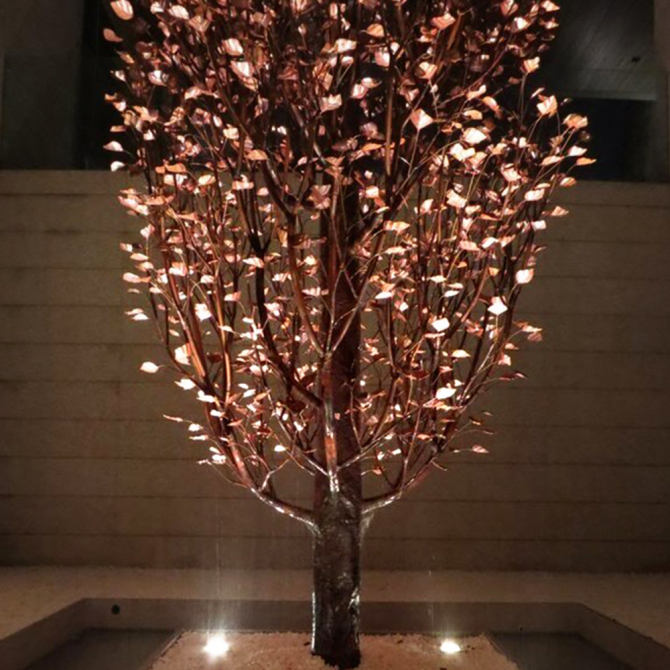 The copper leaves are individually cut by hand and attached to the branches to create as lifelike semblance as possible. 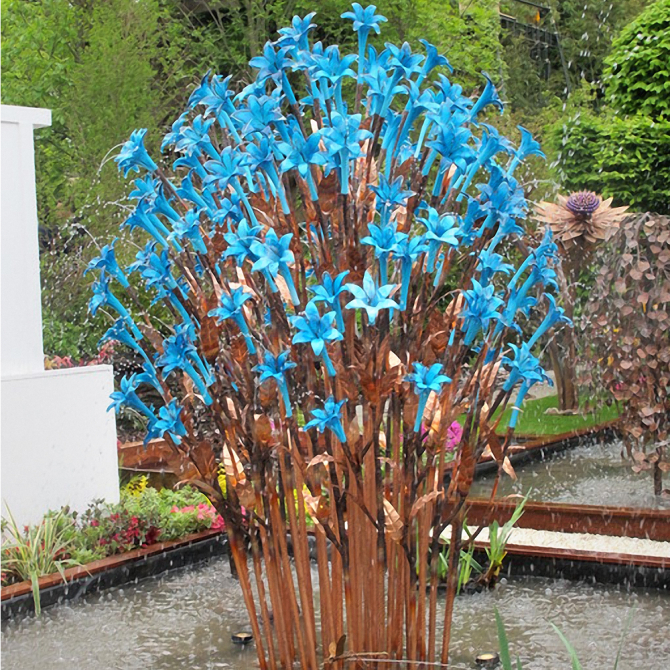 Over time the copper tree fountain will turn a beautiful blueish green shade and the bronze will mellow into a blue turquoise color. The Weeping Willow is a water feature, a sculpture, and fountain that takes one's breath away. 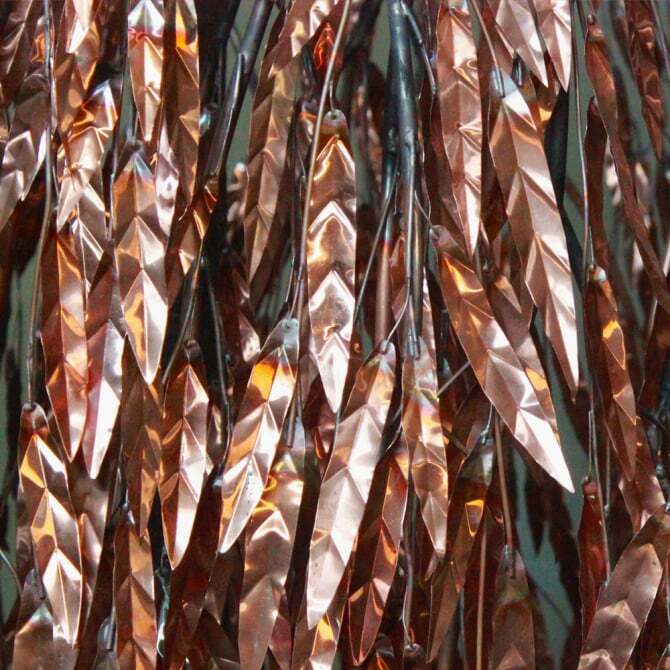 Huge and realistic, shimmering copper leaves in abundance, this water fountain is a stunner. Lit from beneath at night, it is even more magical! 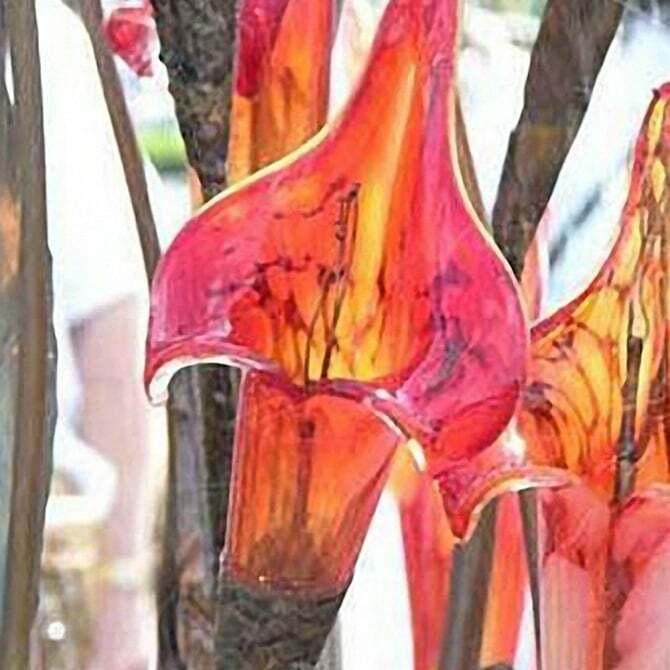 A centerpiece within the garden or large indoor space it is a focal point that will give any setting a unique and artistic finishing touch. The Copper and Bronze of the leaves and trunk will have the years take on a most beautiful patina, aging as if were a real tree. Please see the weeping willow tree fountain photos below to observe the change in color over the years. The photos of this tree fountain were taken in an English garden and the bluish-green patina was acquired over the last five years. Pond size should be 13' (400cm) in diameter. The Bellagio Garden Fountain was commissioned by the Bellagio Hotel in Las Vegas as a stunning centerpiece to their atrium garden. 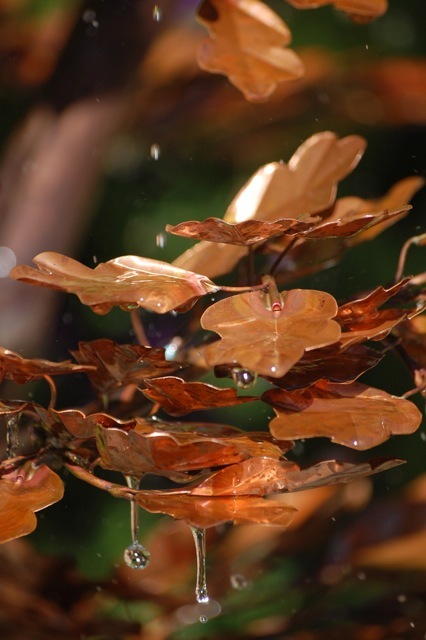 The water feature resembles tall Poplar or Aspen trees in the autumn as the copper leaves catch the light and glitter like gold. 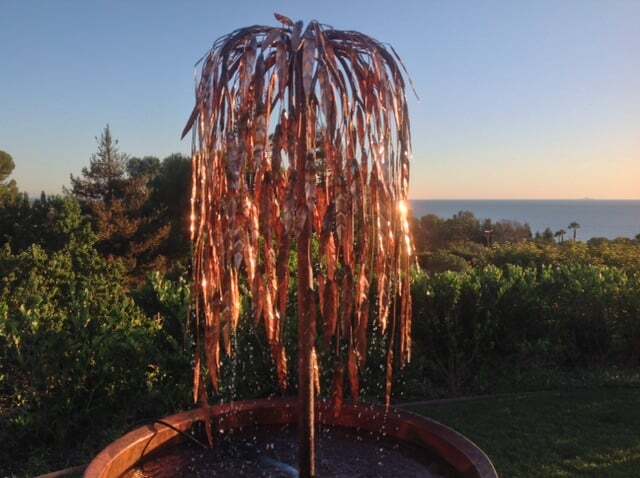 Malibu Tree Fountains and sculptures have been used throughout the world within hotels, banks, private homes and more. Our smaller to mid range fountains arrive ready for display and only need the pump secured and the power turned on. The large fountains would need our craftsman to assist in the set up of the water feature to assure the fountain or fountains are displayed for maximum enjoyment and satisfaction.